Kuala Lumpur is my first stop on my way to Beijing, the plan being to reach it in about 5 months only using overland transportation. The train from Singapore is nice but last around 6 hours. KL is famous for its Petronas Twin Towers which were the highest in the World for some time (they still claim it’s the highest twin towers in the world, twin being the keyword). They are really impressive, I love the blend of glass and metal. I also went to KL Tower which has nothing special except for a better view. I went there at night while I went to the Twin Towers during the day. It’s expensive to get up there and if you’re on a tight budget, going to the KL Tower would be enough. The city has the traditional China Town and Little India neighborhood as well as a more modern and commercial district. The park in front of the Twin Towers is very nice. 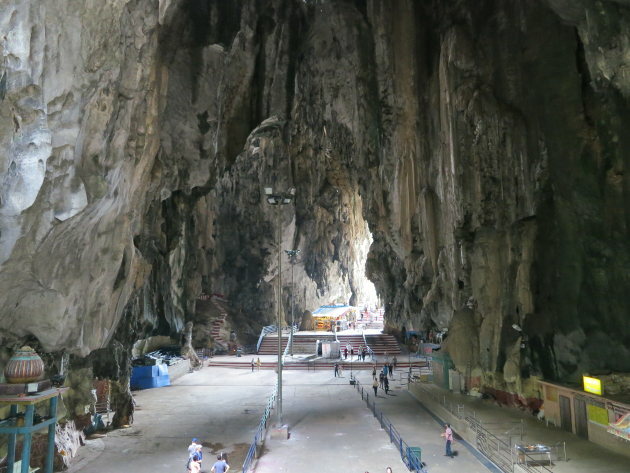 A 30 minutes train ride takes you to the Batu Caves, a system of caves converted to Hindu temples. The inside is huge! One of the cave is empty and pitch black. I did the adventure tour which takes you inside with small lamps. The cave has a vast wildlife and we encountered a snake and other weird animals. The National Museum and the KL Bird Park are other two interesting things to see. The bird park is a vast aviary but I was a bit disappointed by the number of featured species. It’s the perfect place to see peacocks from up close. I enjoyed my stay in Kuala Lumpur, it didn’t feel like it was a huge city and the hostel was excellent.